1916 Ladies Home Journal Brighton Carlsbad Sleepingwear Magazine Advertisement. Scientifically Designed Sleepingwear at Usual Prices. Ad features Pajamas, Pajunions, Men's Nightgowns, and The Nightie Book. H. B. Glover, Dubuque, Iowa. Ad is 16" high and 10" wide. Advertisement is in very good condition, suitable for framing. 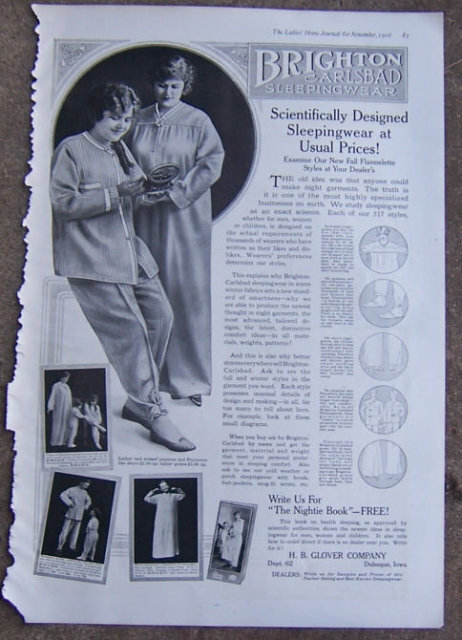 Items Similar To "Brighton Carlsbad Sleepingwear 1916 LHJ Advertisement"